These brand new, professional grade ABEC 3 bearings by Rush are pre-lubricated for a smooth, fast ride. They come in the standard size (608 with an 8mm core, 22mm outer diameter, and 7mm width) and provide the best for performance and durability. 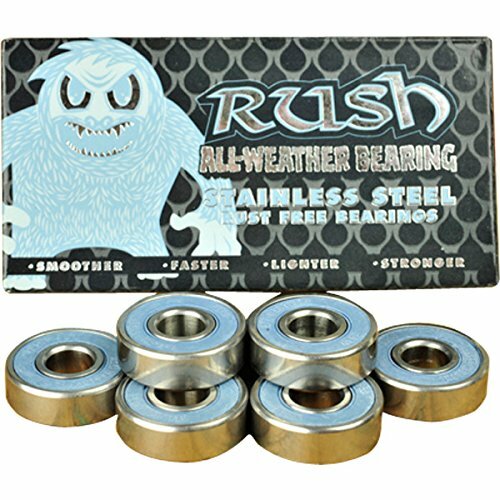 Each set of Rush 8mm All-Weather Stainless Steel ABEC 3 Skateboard Bearings contains eight (8) bearings, which is enough for four (4) wheels.Includes: One (1) set of eight (8) Rush 8mm All-Weather Stainless Steel ABEC 3 Skateboard Bearings from Rush. If you have any questions about this product by Rush, contact us by completing and submitting the form below. If you are looking for a specif part number, please include it with your message.